Under the auspices of the Catholic Church, but a general hospital supported by the general public and admitting patients of all faiths. Offers medical and surgical aid and nursing to the sick and disabled, suffering from acute, curable, and non-contagious diseases. Will not admit tubercular patients. Capacity, 30. Admission to the hospital is by direct application. Charity cases taken by application to the Overseer of the Poor and on the written permit of a City Physician. Medical Clinic daily from 11 to 12, except Sundays and holidays. Diseases of the skin, Mondays and Fridays at 11 AM. Diseases of women, Mondays and Fridays at 3 PM. Eye and ear, Tuesdays, Thursdays, and Saturdays from 2 to 3 PM. Nose and throat, Tuesdays and Fridays at 11 AM. 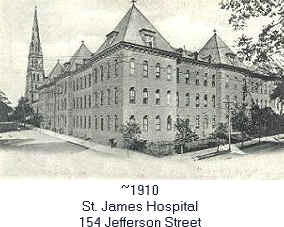 St. James' Hospital was to have been opened in the fall of 1896 but on account of the directors having been unable to secure a corps of sisters to undertake the management, it was postponed until this is accomplished. In 1978 the hospital was the primary emergency receiving hospital for the airport, port, and Newark portion of the New Jersey Turnpike, plus the Ironbound and E. Newark area. It has a special intensive care and coronary care unit, Department of Nuclear Medicine, and Department of Physical Therapy and Rehabilitation.